Sandy Toes is a 6 bedroom, 6.5 bathroom home that sleeps 20 guests. Entryway & common area on the 1st floor of the home. Common area has comfy seating, round table with chairs, and a flat screen TV. First floor bedroom with connected bathroom and flat screen TV. Sleeps 6 guests. First floor bathroom with walk-in shower. Sandy Toes features a great open floor plan, perfect for gathering the group. A fully stocked kitchen with stainless steel appliances and bar seating for 6. Dining area, seating up to 12 guests. Cozy living room with flat screen TV, queen sleeper sofa, and balcony access. Second floor hall bathroom. Queen-sized bedroom located on the second floor, with connected bathroom. Third floor common area with flat screen TV and futon. Queen over King bunk bedroom with en-suite, located on the third floor. Connected bathroom with walk-in shower. Queen-sized bedroom with en-suite, located on the third floor. Connected bathroom with walk-in shower. King master suite with en-suite, flat screen TV, and direct balcony access. Master bathroom with double vanity and walk-in shower. Second King master suite with flat screen TV, en-suite, & direct balcony access. Third floor terrace with lounge seating and gulf views. Outside pool deck, grill, and lounge area. Sandy Toes sits in the middle of Salty Kisses, right, and Bare Feet, left. Located on the West End of Panama City Beach, this home will offer access to the most beautiful beaches in the world! 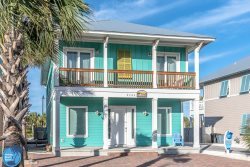 With spectacular views of the Gulf of Mexico, this 3,300 square feet beach house will sleep up to 20 guests. Conveniently located on the tranquil West End, yet within only 5 miles of the bustling Pier Park, Sandy Toes is a prime location for night life, yet still provides peace and quiet for a family escape!! Guests will enjoy many amenities that make each beach vacation unforgettable. Relax by the private pool, cook up a feast on the commercial Green Egg grill, or watch the sun fade away from one of 3 private decks. Sandy Toes spared no expense when it comes to a 5 star experience. The beautiful white sands and the Gulf of Mexico is a spectacular sight. Guests can enjoy the luxury of the pool, and grill without compromising the remarkable views of the Emerald Coast. WiFi is provided throughout the home, as well as Cable TV. Sandy Toes also provides a memorable escape with it's impressive outdoor living space. You can soak in the private pool, cook a feast for the family on the outdoor grill while relaxing on the chairs overlooking the Emerald Coast. Sandy Toes has everything you need to make your beach vacation unforgettable. Right when you walk in, you are embraced by the feeling of home! First with a 2nd living room with comfortable seating to watch TV or play a card game at the table. Walking down the hall to the 1st bedroom with 2 twin over full bunk beds with a connecting bathroom, which also leads right to the pool deck. The pool deck is furnished with loungers and table & chairs to enjoy the commercial size grill next to the pool. The 2nd floor opens up to a kitchen with seating for 18. Equipped with state-of-the-art appliances and fully stocked kitchen, where you can't go wrong with home cooked meals. Sit with the family and enjoy the views sitting off the kitchen/living room balcony. Travel down the hall to a queen bedroom with a connecting bathroom and walk-in-closet. Climb up to the 3rd floor to see the common area with TV and reclining couch. The 3rd floor consists of 4 bedrooms. A queen over king bunk room with a connecting bathroom. Next to this is the queen bedroom with a connecting bathroom and walk-in-closet. Walk across the house past the common area and we have the 2 king bedrooms with ocean views. Each has its own bathroom and a shared balcony. Need two homes to accommodate your group? The same layout and bed arrangements. Bunk room - 2 sets of twin over full beds. Room sleeps 6. Door leading to pool deck area. This home brings luxury and comfort together to make an unforgettable beach vacation!